Finally! Apple had said that Leopard (Mac OS 10.5) would be shipping in October a while ago. Originally it was supposed to arrive over the summer, but (supposedly) the pressure to get the iPhone out the door in time pushed developers off of Leopard, and delayed the release. Half way through October we hadn’t gotten any updates from Apple on the release date of the new OS. The wait for the announcement is over, and now the wait for the release can officially begin. Apple will ship Mac OS 10.5 Leopard on October 26th at 6pm. Besides all of the new features that this new OS will provide, there are a couple other reasons I’m anxious to get Leopard installed. First of all, the license to use Bootcamp will expire at the end of October. Leopard will feature the final release of Bootcamp, so the new OS is required to keep using it ‘legally’ keep using it, or do any new installations (thanks Trevor). 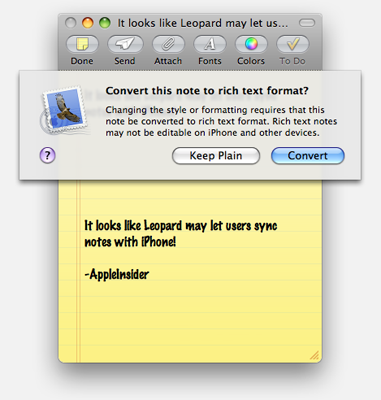 Secondly, there have been signs and speculation has been confirmation that the release of Leopard will unlock some new functionality in the iPhone. I’ve also read speculation (that I’m a fan of) that the iPhone’s official API’s may mimic those of Leopard, and that the release of Leopard will eventually deliver us an Official iPhone API for native applications. Digg has this link to all 300 features of Leopard listed out on one page, so you can spend the next 10 days memorizing the features that you’ll gain once you make the upgrade. I’m super excited to get Leopard! Just one thing to add, Bootcamp will not quit working once Tiger is released. The Assistant app might, but if you already have it setup you should be fine. BTW – loving the new blog layout. looks great.